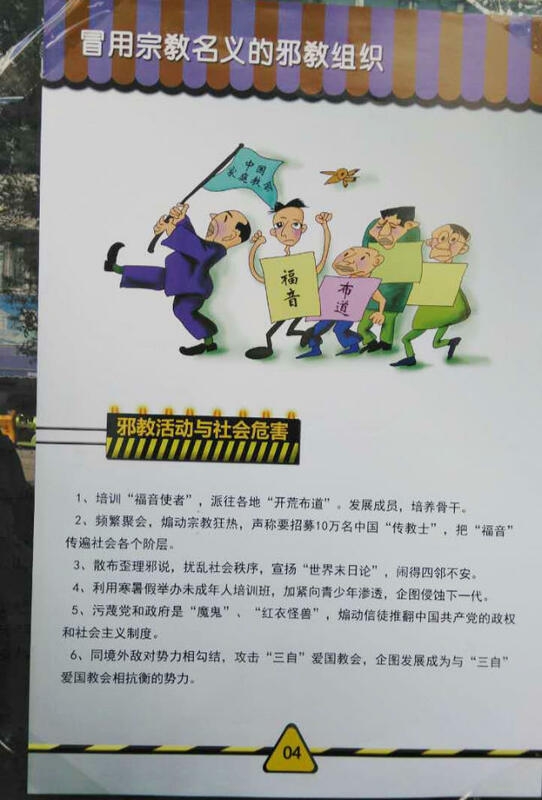 A government propaganda poster “Xie jiao organizations that falsely use the name of religion.” “Chinese house churches” is written on the flag. The poster lists the harms by xie jiao, including the spread of religious fanaticism, dissemination of heretical ideas, disturbance of social order, collusion with hostile foreign forces, and attacks on the Three-Self Patriotic Movement. The label xie jiao, reserved for banned “heterodox teachings,” is now increasingly applied to “normal” house churches. They do not accept government control; have overseas ties; have a large number of members; actively preach the Gospel; read banned spiritual books… These are the characteristics of the largest house churches in China today. But these are also the characteristics of the so-called xie jiao groups that the government violently suppresses. Chinese publications in English misleadingly translate xie jiao as “evil cults,” but a better translation is “heterodox teachings.” In theory, what teachings are “heterodox” and prohibited is determined by the government, an old practice dating back to the Ming Dynasty era. Your religion is a xie jiao if the CCP has included it in the list of the xie jiao. In Xi Jinping’s China, however, general hostility to religion leads to administrative practices going beyond the laws and regulations. Increasingly, the label xie jiao is used against groups that are not in the list of the xie jiao. In the minds of some Chinese officials, making veiled criticisms of the government and not accepting the government’s leadership means that a person or group is anti-Party and anti-government. These are among the standard characteristics of a xie jiao. Many Chinese house churches have faced the same predicament as Zion and Early Rain Covenant churches. Some churches have been regarded as being a xie jiao because they “didn’t obtain a permit” for using the premises they own or rent for worshiping purposes, “didn’t listen to the government,” or were suspected of being linked to foreign countries. Since May 2018, a Great Praise house church in Tanghe county, in central China’s Henan Province, has been ordered repeatedly to cease gatherings. The female preacher refused to comply. In August, government officials threatened to demolish the meeting place unless it was completely emptied, claiming it was an illegal meeting place, that the church was a xie jiao, and that anything not allowed by the state must be eliminated. On September 11, the government sent more than 100 people to vandalize the meeting venue. Afterward, the preacher was arrested and interrogated twice. The police questioned her about whether she had contacts with foreigners and who the church’s top leaders were. They asserted that having contact with foreigners is tantamount to being a spy. An Apostolic house church meeting venue in Chongqing city’s Tongliang district in southwestern China has also been deemed as a place of worship for a xie jiao. In April 2018, more than 20 government officials stormed into the meeting venue, asserted that it was an illegal gathering of a xie jiao, and threatened detention for 15 days for minor violations in the future, and prison sentences for major offenses. Some observers have noticed the move to label house churches as xie jiao since the so-called McDonald’s murder of 2014 when a salesgirl was killed in a McDonald’s restaurant in Zhaoyuan city, Shandong Province, and the Chinese government falsely blamed The Church of Almighty God for the murder. Subsequently, it used the incident as propaganda in their anti-xie jiao campaign. They worried that the Chinese Communist Party (CCP) government would use this designation to eliminate those house churches that the government “dislikes” or that cross some “red lines” by becoming too large, criticizing the government, or maintaining contacts with foreign organizations.